Project Blue Book will validate all of your hypotheses and offer you some entertainment on a subject matter you truly enjoy. Josef Allen Hynek was born in 1931 in Chicago and earned his PhD. from Yerkes Observatory in Wisconsin. He became a professor at Ohio State University and taught astronomy until one day in 1948 when the United States Air Force enlisted his help to bring credibility to some otherwise unexplainable, unusual events. He spent year debunking so-called "sightings" especially because that is what the military expected of him. However, later in his life, he admitted some trepidation with his previous findings and claims to debunk UFO sightings and encounters. 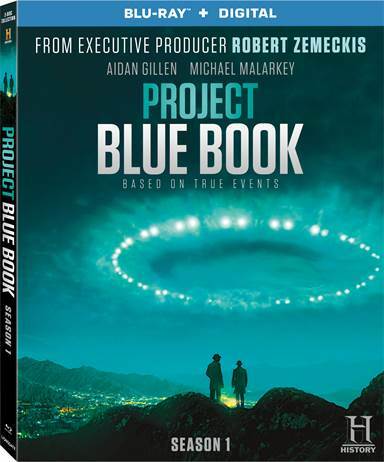 In 2018 History Channel decided to use some of Hynek's findings and stories to create a television drama called Project Blue Book. In Episode one Hynek (Aiden Gillen; Game of Thrones) joins Captain Michael Quinn (Michael Malarkey; The Vampire Diaries) on a trip to a Military base where one of the pilots claims to have engaged in a dogfight with an unidentified flying object. As Hynek investigates he cannot find reasonable explanations for some of the things the pilot says and the damaged caused to his plane. In an attempt to waylay Hynek's concerns, Quinn takes him a flight to replicate the pilot's account and disprove it as merely a weather balloon. Even though Hynek isn't convinced, after they crash land and nearly die, Quinn submits their report anyway leading Hynek to suspect that he hasn't been brought on to truly investigate but to be used as a credible figurehead that people will believe. The other nine episodes of Season One follow much of the same pattern although as each investigation progresses, Hynek and Quinn grow a little more skeptical as throughout the season they see more and more unexplained events and eyewitnesses (some of them pretty credible) even as they are told to discredit the events and people. Gillen is truly believable as the College Professor who uses facts to try and understand these sightings. He plays the part well with a hint of skepticism yet a pile of awe and wonder and true excitement over the discoveries is his making. Malarky is less convincing as the military man though the two have decent chemistry making them a team, albeit a reluctant one. The supporting cast and guest stars a fairly decent for the most part but no one stands out amongst the others. The production value is fairly strong for a television show and it is obvious A&E Network put some money into it. The 1080p video quality is fairly decent and blacks are deep and not overly grainy. I assume they made it intentionally a little grainy because it is supposed to be set in the 1940s. The audio is Dolby Digital Audio 2.0 which is probably what was used for broadcast. It is okay for the most part but nothing stands out as superb as far as the sound quality goes. The combo pack has a Blu-ray with all ten episodes and a Digital download code. There aren't any extras which is a little disappointing. Some of the stories are a little far-fetched and unless you are a true believer in extra-terrestrial life you may find the subject matter a little hard to swallow. However, if you buy into the whole theory that we are not alone in the Universe and that Earth has been visited by aliens (or even that they may live among us), then this is a television show for you. It will validate all of your hypotheses and offer you some entertainment on a subject matter you truly enjoy. While not the best drama on television, it is entertaining enough if you are into UFOs. Download Project Blue Book Season 1 from the iTunes Store in Digial HD. For more information about Project Blue Book visit the FlickDirect Movie Database.